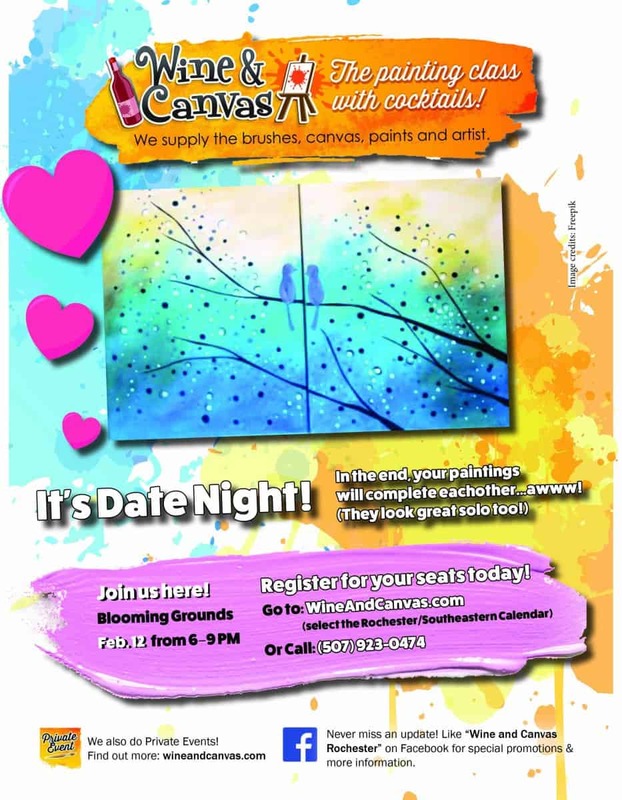 Wine & Canvas – DATE NIGHT! Price is per painter, not per couple. Feel free to come on your own and just paint one half of this beautiful painting! If you are registering with a coupon or gift certificate and your credit card information is requested; your credit card will be charged. Only enter your credit card if you have a balance due. Please go back & re-enter your code in the correct field or call the studio for assistance. If you are registering with a Deal of the Day code, enter the code in the promo code box. Wine and Canvas is an entertainment event much like a concert, dinner theater or movie theater. Your credit card will be charged upon completion of your transaction. Wine and Canvas has a 48-hour cancellation policy; with 48 hours notice we will reschedule or refund your registration. Please review the FAQ’s page for additional information, or call (507) 923-0474. If the class minimum is not met, the class will be cancelled the day of the event, so please use the best phone number to contact you when registering, so we will be able to let you know of any cancellations.